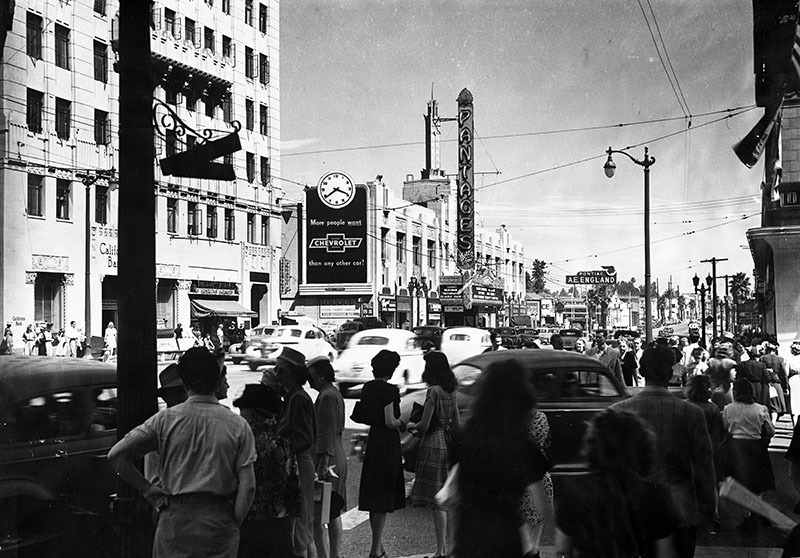 Hollywood Boulevard may be our own Times Square, but don’t let that keep you from drinking up the the area’s backstory. Forty-four red historical placards, most on streetlamps, on both Hollywood and Vine tell the tale. About a third are in front of businesses that serve liquor. So you can experience the boulevard as Ernest Hemingway and F. Scott Fitzgerald did—sloshed—and learn a little history to boot. Here’s an easy six-stop saunter. This 1929 Spanish Colonial Revival building was designed by Carl Jules Weyl, who won an Oscar for art directing 1938’s The Adventures of Robin Hood. Toast him with a 34-ounce stein of beer in the Snow White Café, which has been here for 70-plus years and features vintage Disney murals and a wisp of Tudor woodwork. It’s 0.2 miles to the next stop. One of California’s most iconic restaurants and bars opened 99 years ago and was a fast favorite of writers and actors. Gossip columnists Hedda Hopper and Louella Parsons conducted celebrity interviews in the wood booths, and bartender Ruben Rueda has poured drinks for everyone from Steve McQueen to Johnny Depp. Your next stop is another 0.2 miles away. The last Victorian-era home on the boulevard was a wreck when developers moved it to the back of the lot and built shops where the lawn had been. Today that home has been grandly reimagined as the Houston Brothers’ fanciful bar No Vacancy, reached by a hidden entrance off Hudson Avenue. If you can get past the bouncer, reward yourself with a Rye Bramble. Onward for 49 feet. Silent filmmaker Jesse Lasky built this four-story apartment house in 1917 as a friendly residence for actors in a neighborhood that wasn’t all that fond of them. These days the ground floor is home to Black Rabbit Rose, a magic nightclub (also owned by the Houston Brothers), where you can make a $400 bottle of rum disappear. Next stop: 0.4 miles. The Frolic Room has been a part of this 1930 Art Deco masterpiece almost since the beginning, with a neon sign giving the theater’s marquee a run for its money. Grab a stool by the magnificent Al Hirschfeld mural and count how many stars from the Golden Era you recognize as you sip a Brandy Alexander or two. It’s another half mile to complete the tour. This Spanish Colonial Revival stunner has been home to Boardner’s since 1942. If you still have your wits about you after finishing the Dark and Stormy cocktail, stop inside Larry Edmunds bookshop around the corner on Hollywood and browse the memorabilia. Better yet, pick up a few history books. Your starting point is 0.2 miles away.